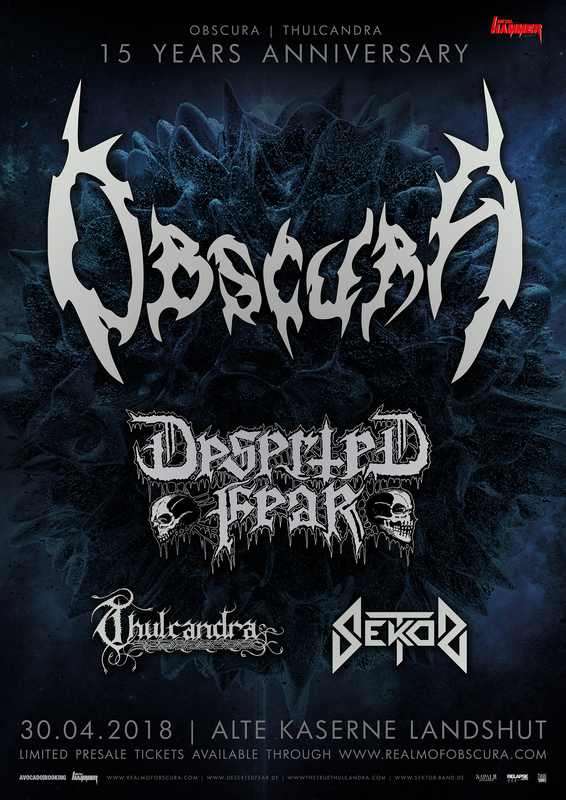 The worldwide leading Progressive-Death-Metal band Obscura has been founded in Landshut, Germany in 2002. Following national and international chart-breaking records, tours within Europe, the United States, Asia, Middle East and Central America and support by MTV / VH1, their new album “Akroasis” sets new standards in Death Metal. Obscura returns to Landshut, Germany, the place where everything begun, for one special evening to celebrate their 15 Year Anniversary. As part of the „Akroasis World Tour“, nothing but an excellent performance and stellar live show will be guaranteed. Thuringia´s Deserted Fear are crafting their vision passionately and merciless since 2008. Their debut album „My Empire“ (2012) blew up a lot of dust and they are on their way to become one of the most important forces in the European metal scene. Deserted Fear combine the sound of Swedish death metal with US old school death metal to create their very own, modern sound, without losing heaviness and authenticity. Thulcandra was founded back in 2003 by Steffen Kummerer (Obscura) and Juergen Zintz with the intention to write music in the vein of Dissection, Sacramentum, and Unanimated: music that celebrates old-school Swedish blackened death metal. Following three successful records through Austria’s Napalm Records, numerous tours within Europe and a strong following, Thulcandra pay homage to a style brought back to life with blazing intensity. Sektor is a rising Blackened Death Metal Band from Landshut, Germany. Since 2011, they are gaining rising attention with gigs supporting bands like Negator or Izegrim. In this context, the musical facets which reflect the roots of the individual members, form a sound with greatest possible sovereignty. Dieses Thema wurde geändert vor 1 Jahr, 3 Monate von shredmanwalking.